Was $173.50; Save $58.50 until 29 Apr 2019! 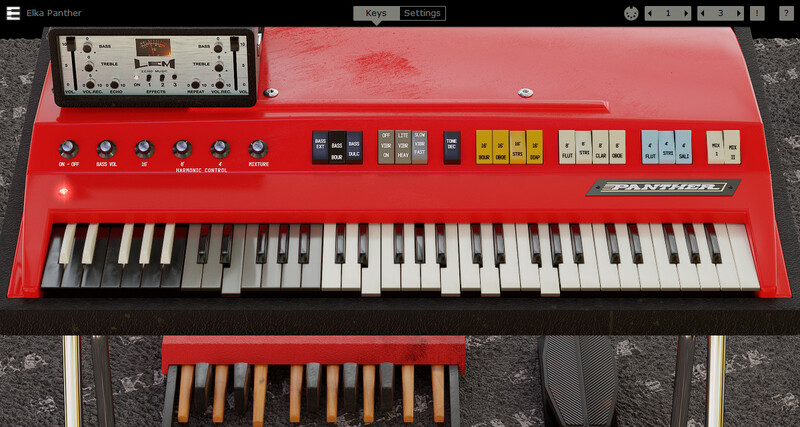 The Elka Panther, also known as the Capri, is a classic Italian combo organ of the 1960s. The Panther produces bold, rich organ sounds and has a wide range of tonal variations (13). The Panther's 16', 8', 4' stops and Mixture voice levels are freely adjustable. Each note spans over three octaves, the bass can be extended into the grey keys, and there is separate volume control for the bass octaves. Tone Decay adds a percussive effect to the Mixture voices. The Panther has a powerful vibrato with speed and intensity control.